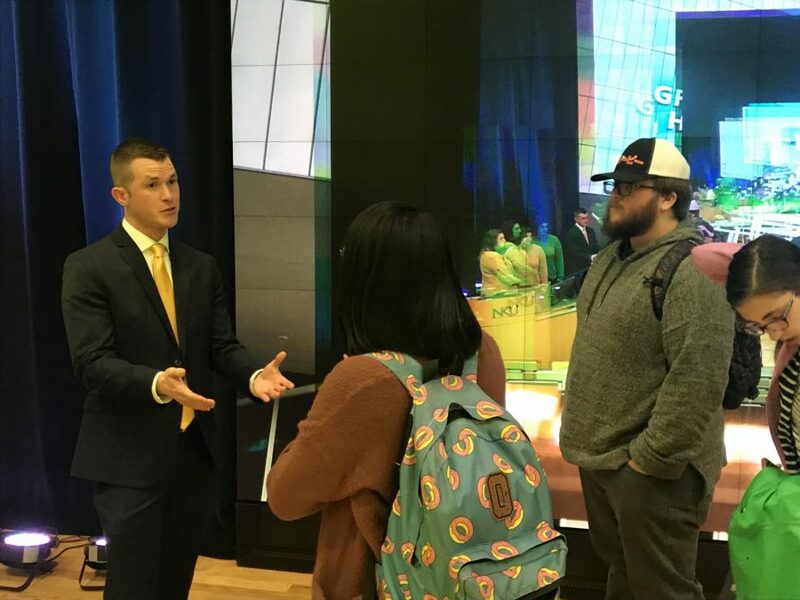 WLWT Reporter and NKU alumnus Dan Griffin talks with electronic media and broadcasting students in Griffin Hall's Digitorium. Dan Griffin was in seventh grade home economics class when he first realized he wanted to become a news reporter. He remembers learning how to sew pillows when a teacher burst into his classroom, tears streaming down her face. She told the teacher at the front of the room to switch on the TV. On the screen, Griffin saw the smoldering World Trade Center in New York City on CNN. It was Sept. 11, 2001. Seeing reporters covering the tragedy shook Griffin, but it also inspired him to step up and tell challenging, and even heartbreaking, stories. “I need to do this. 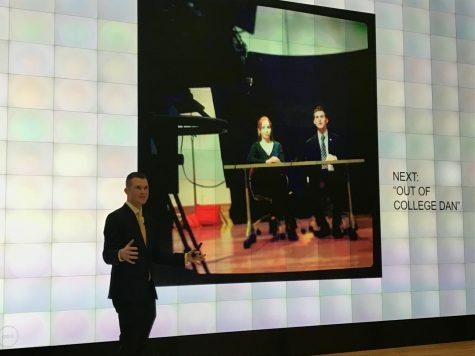 I need to be there to tell people what’s going on,” Griffin recounted to a crowd of NKU informatics majors in the Griffin Hall Digitorium Thursday. A 2012 NKU graduate, Griffin is now a reporter for WLWT-TV in Cincinnati with dreams of reporting in Washington, D.C. He told students that being a TV journalist is a challenging job, but it doesn’t come without its rewards. Griffin, one of four sons raised by a single mother in Lexington, was the first person in his family to earn a four-year degree. “My mom was the push for me. She got a two-year degree at KCTCS and she always pushed education, and that you do better and do more,” Griffin said. He remembers eating almost every meal at the Village Cafe in Norse Commons after finishing shifts at his part-time job at Fifth Third Bank. As an electronic media and broadcasting student at NKU, Griffin produced and hosted newscasts as part of his curriculum. “Coming here was growing up for me. I established my adult life here. I figured out who I was and what I was meant to be here,” Griffin said. But breaking into the news media industry after college is no easy feat, and Griffin remembers applying for over 80 positions at TV stations across the country. “You would have thought I was the ugliest, most unskilled person ever—I got two offers,” Griffin said. With the help of a reference from NKU media professor Wes Akers, Griffin accepted one of those jobs at WAOW-TV in small, snowy Wausau, Wisconsin. What’s it like to be a new reporter in a strange, new town? Think of it like a reality show, Griffin said. 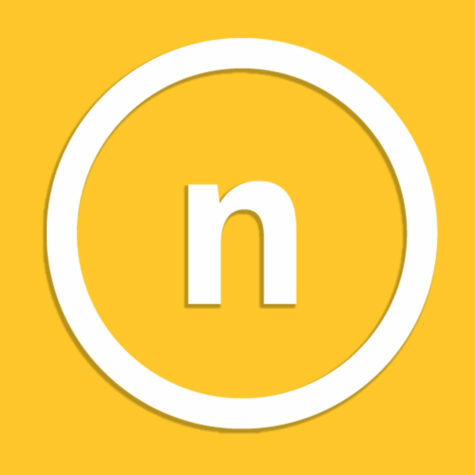 “It’s a bunch of random people from across the country. You have no family, you have no friends, you don’t know what you’re doing and you’re struggling to all come together,” Griffin said. As a “one-man band,” Griffin shot video, edited it down, wrote news articles and appeared on camera to deliver community stories to hometown viewers, all for $11 an hour. As an electronic media and broadcasting student, WLWT Reporter Dan Griffin would produce and host newscasts in Griffin Hall’s production studio. In TV, it’s not common to stay in one city (or market) for long, and Griffin’s friends at WAOW gradually moved on to places like Philadelphia and Chicago. Griffin also moved on, taking a position at WSAZ in Huntington/Charleston, West Virginia. Griffin came closer to home in Cincinnati in 2015, and he said he just signed a contract with WLWT guaranteeing he will stay in Cincinnati until 2021. “I never thought I would stay in any station for six years,” Griffin said. Griffin’s remedy for pre-show jitters? In Wisconsin, Griffin said he was given more basic assignments, but that changed when he arrived in Huntington-Charleston, where he covered new and growing crises like widespread opioid addiction and a water crisis that affected thousands of West Virginians. While he no longer has to be a one-man band, reporting in a mid-major market like Cincinnati brings new challenges and some intense subjects. In summer 2016, 20 people overdosed in Cincinnati in a single night. Griffin, by then a WLWT reporter, recalled racing to scene after scene on that hot August night. He listened closely to the police scanner in his vehicle, and a friend in the police precinct told him where overdose calls had been made. Showing a clip of one of his reports, Griffin recounted a particularly heartbreaking vignette from one of those stops: a 6-year-old child was trapped in a pickup truck as his father lay unresponsive in the front seat. When the father was revived with Narcan, which reverses the effect of an opioid overdose, the child was placed in a police squad car. No matter where you’re working, Griffin said, it’s easy to start feeling low. Covering intense subject matter, being far from family and being paid little takes its toll. Early on, he remembers making the drive on his off days from Wausau to Madison, Wisconsin to sit in front of the statehouse by himself. “I was alone. I felt really alone,” Griffin said. But as time went on, Griffin said he made some of his best and longest friends in the first TV stations he worked. Griffin has a love of politics, and one day hopes to report for the Washington, D.C. team for Hearst, WLWT’s parent company. Citing the recent National Mall incident involving a student from Covington Catholic in Kentucky, Griffin said it’s more important than ever to pause and verify new information, even when social media can drive narratives at lightning speed. But it’s also an encouraging time to work in any newsroom, Griffin said.